What's Your Story With SHaR? DeepFriedBurger A lot of people played SHaR when they were young. A brief look into the comments on most YouTube videos regarding SHaR can confirm that. What's you're story with SHaR? When did you start playing? A lot of people played SHaR when they were young. A brief look into the comments on most YouTube videos regarding SHaR can confirm that. What's you're story with SHaR? When did you start playing? How did you find the Donut Team? My story with the game is rather long, so you might want to prepare to read this. You ready? Got you're fake, make me look awake glasses? Alright then. When I was very young (probably about three years old), my brother had an original Xbox. One of the games that he owned for it, was The Simpsons: Hit & Run. However, I never saw him play it as I was very young and had never heard of the concept of electronic entertainment. Although my brother claims to have 100% completed it at the time. As I grew older, my brother (and sister) came to own an Xbox 360, and that's what they played it on. When I reached the age of six, I started to play. Keep in mind that this was one of the first video games that I had ever played, the first being a demo of Cars on the Xbox 360. From what I can remember, I didn't really play the missions. At the time, I had some really strange obsessions with automobiles, how they looked, signs, and certain visual things. For those reasons, I spent a lot of time driving around the maps, standing around looking at the truck accident by the Kwik-E-Mart in Level 1, staring at the School Bus that had crashed into thr DMV in Level 2 or 5 (not sure which, probably Level 2) both from outside of the DMV, and inside, driving the School Bus into the alleyway by the Aztec Theatre in Level 6, jumping the ring of fire ramo by Mr. Burns' Casino in Level 6, and driving around with Nuclear Waste on my vehicle in Level 7. On a small note, I once jumped the ring of fire ramp in Level 6, and managed to land at a certain spot in the Squidport area. I was unsure how to replicate this for ages until recently I descovered in LiquidWifi's speedrun tutorial video on YouTube that it happens by resetting you're vehicle at a certain point in the jump. Eventually, when I was about seven, the game disc stopped working and I was really upset, going as far as to cry about it and constantly washing it with washing-up liquid and water to see if I could get it to work. I once saw it with my family about a few months after at a charaty shop, but I don't think I cared anymore. Continuing onwards when I was eleven I passed the oppertunity to get the game on eBay, and eventually managed to purchase it later that year. I didn't like it. Then, over a Christmas holiday, me and my brother started talking about the game. Out of random decided to start up the game and started playing it again. With his help I completed it, and have liked it ever since (pretty long time ago). Since then I've continued to play. I started to discover mission tricks, glitches, cheat codes, etc. My brain has basically become a documentation of SHaR since then. It's been my favourite game since. At this time, I had heard of a modding community, and I have to admit, I though (without ever seeing it) that it was trash, and I am very ashamed of this. At the time I had no clue what oppertunities modding could provide, and I was a little stubborn. Anyway, later that year I began to notice the modding community, but never joined until way ages later. I first got SHAR back in 2006 on PC for christmas. I sucked so bad at it tho.. I couldn't even get out of homer 1, no joke. People made fun of me because I was sooooo bad at the game. But now after practice and actually being bothered to try, I've become a lot better. It's crazy how I never knew about skipping missions back then.. once I found this out, I was so happy to be able to explore the other levels in the game. There was a period of time where I had misplaced my discs for the game and so I got one of those dodgy non-legitimate versions.. but now I've found my discs and have kept them in a safe place. It's nice to listen to the soundtrack and to be able to drive the Electaurus without the game crashing. I have also picked up the gamecube version of the game fairly recently. A few years on, I decided to look into the game files and discovered the mfk files. I had so much fun editing random stuff in missions and for cars (whilst making the game crash a million times). I later stumbled across the P3D editor, although I don't believe it was on this site at the time. I remember feeling so happy knowing I could replace textures and stuff. In 2014, I came across Donut Mod and this site. I really enjoyed seeing other peoples mods for this game, and I was very excited for the future of modding this game. I eventually created an account back in 2015. Since then I haven't posted on this forum until very recently.. I've had so much fun playing mods over the last few years and I've even tried to make my own.. Who knows, maybe I'll release one someday. I have started to speedrun this game, although I haven't yet uploaded any runs. My best time at the moment for ASM (All story missions) is a little over 2 hours. I've got lots of easy time saves though and sub 2 should be easy. SHAR is up there with my favourite games of all time. But yeah, 19 year old me is waaaay better at this game than 7 year old me, that's for sure! I would have been between the ages of 5 and 10 when I was first introduced to the game. I went over to a friends house and his sister was playing it, she was on level 3 driving the school bus outside the observatory probably doing the Operation Hellfish mission. 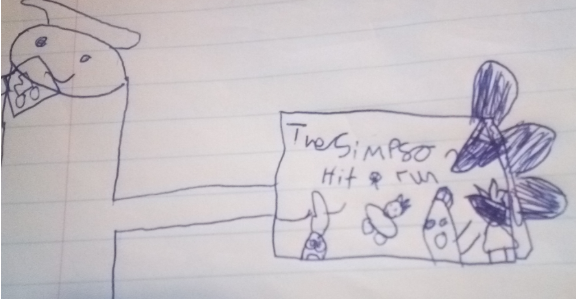 I didn't get to play it but I was really intrigued and after a short amount of time I went to visit my dad with his girlfriend at the time, and at their house I saw they had The Simpsons: Hit & Run. I remember every time I went there I would just play SHAR constantly. I loved that game so much I don't think I've ever loved a game like I loved SHAR. I don't remember much of it except for sitting on the bed in the basement playing it while listening to Karma Chameleon for some reason. I do remember having so much fun kicking Ned's lawn chairs around (those things go flying when you kick them) Of course I wanted the game for myself so I asked my grandma so much to get a copy for me: "If the cops catch you, you lose money so it teaches good driving", horrible persuasion attempts aside I did get it for Christmas presumably that year. SHAR is permanently associated with Christmas for me now, still sometimes I'll be playing the game and get random Christmas-y feelings, which probably makes the game even more special to me. That's the thing about SHAR for me. I love it so much and it's such a special game for me that still gives me even trace amounts of childlike joy to this day. Not even Minecraft means as much to me as SHAR. I've known about the games modding community for years but never went beyond watching about a minute of a Donut Mod YouTube video until July of last year I started making some custom missions. I guess learning about how it works and making custom missions is kind of my way of thanking the game for all the good times, it's also super fun as I've gotten big into programming and game development since my early days playing SHAR. Around 2004ish when my parents split my dad had a ps2 in his flat, the three games he owned were Splinter Cell, this, and another game i don't remember the name of. I spent those weekends playing it on the ps2. I was pretty young, there was a gas station that had the game, I rented it practically every week. Eventually, I bought the game, with the excuse that "I'll just ignore the bad words". I always loved running around Springfield not doing the missions.I remember my original memory card I had for my PS2 is somewhere deep in my Grandma's house. My cousin told a few lies, and said that the final level is Maggie fighting the Truckasaurus. I don't really have many memories of level's after Apu's because I could never finish one of the Apu missions. If i write very bad is because english is not my natal language now i'm going to start. When i had 4 years old i had an PS2 and one of the games was Shar. I loved that game and i knew the red brick trick. I got my first PS2 from my cousin for Christmas in 2008-ish when I was about to turn 6. He only gave me a few games, like ATV Off-road Fury 2 and 3 (2 is better), so he took me out to Gamestop later that day to buy some more games. I don't actually remember if I got any other games, but I do have the image of me looking at SHaR on the shelf burned into my memories. I bought it, and played it non-stop for a good while. I remember being particularly proud of me beating level 1 and watching the opening cinematic of Bart walking up to Milhouse. I was never able to beat Cell-Outs, probably because I used the Honer Roller, so I would spent countless hours driving around levels 1 and 2 and making up my own little adventures. Eventually, probably in 2010, my neighbors, who were a few years older than me, had a copy of the game, and they showed me level 4, which broke my 7 year-old brain. Eventually, they let me copy their save data from level 5 to my memory card, but I ended up copying my data from level 2 to theirs by accident. They forgave me, and I eventually beat Cell-Outs, although I don't remember the specifics of it. At this point, it was probably in 2011, so I still don't remember much of my experiences of levels 3 and 4, probably because they aren't that great, but I do remember getting past From Outer Space and the drive to the Cola Truck with Apu. I remember beating Curious Curator and getting to level 6, although my game crashed and I had to redo Curious Curator. After I beat Kang and Kodos Strike Back, I remember driving around in the 70's Sports Car and being absolutely terrified of level 7. I didn't touch the game for a good year after that, I was that terrified of it. Once I overcame my fear of level 7, I continued on until Alien "Auto"topsy Part III, and tried that mission for hours. I finally gave up after hitting the side of a building right after driving off the ledge near the Krusty Burger next to the school. Another year definitely passed before I came back to beat the final mission. I don't remember much aside from me actually finishing it and being proud of my 5-ish year journey. Skip ahead a few years, and I managed to 100% the game. I ended up watching some reviews to see if people actually thought the game was good, and i ended up learning about Donut Mod. I thought it was cool, but forgot about it for awhile. I ended up getting the game in near-mint condition from a game store for Xbox about 2 years ago, and I 100% it as well. Ended up getting a copy for PC last year and getting 100% as well, and decided to look into mods. I found this site in... maybe April of last year? I tried out some mods, thought this community was cool, and here I am now, lurking through boards and trying out new mods. For some reason, I feel the need to go in-depth about when I 100% completed the game for the first time, when I was around twelve years old. Something to note is that I found most missions difficult because I was not using the Handbrake. I knew about the Handbrake, but always thought it was useless. After several playthroughs, however, it turns out that the Handbrake is one of the most valuable things in the game, and is key to success. So, when I managed to get the game disc again, I barely understood how the game worked. I played the first three Missions of Level 1, and started the forth Mission, Blind Big Brother. I saw all of the Power Coupling and thought that it would be too hard, and I was lazy. So I exited the mission, and didn't play the game for a while after that. Come around Christmas that year. Me and my brother are talking about the game. About various things you can unlock, etc. So out of random, I decided to start up the game. From then on, my brother helped me for the majority of my first playthrough, only not helping as he was busy when I decided to 100% complete Levels 5, 6, and 7. Monkey See, Monkey D'oh: My brother actually had to do this mission for me, and yet strangely no other mission. I could never collect the Monkeys in time. Never Trust a Snake: I briefly stopped playing this mission because it was difficult, and I thought that it was impossible. I did eventually beat it though. Set to Kill: The most obvious one, First, I had trouble managing to hit every Free Laser Gun Stand in the time limit, but then needing to return to Krustylu Studios in 50 seconds stole the show. This objective didn't stop me from playing, like the others, but I ended up sinking over a good twelve hours into beating it. I found this game back in 2011 after finding the trailer for it on Youtube. I was about 10 at the time and I was just looking up Simpsons clips when I saw "Simpsons Hit and Run" come up in the search bar as one of the predicted searches. I clicked it and watched the trailer and then found a let's play of the game made by this guy named Slim Kirby (who recently started doing a replay of the game). I watched the entire Let's Play (runining the whole game for me) and then I deciced "hey, I want to play this!" I knew I had a PS2 which used to belong to my Uncle, so I ordered the game off Amazon and I was so excited when it finally arrived. On the day I got the game, I had to do some chores before going out to my sports club later on, which I completely forgot to do and got told off by my Mum for not doing them, threatening to take away the game if I didn't do my chores. Ended up finishing the game a couple weeks later, forgetting about it for the most part, though it came back into my head from time to time and I did a playthrough again back in 2015 for the fun of it and then another one back in 2018 (which I finished in only 2 days). I knew about Donut Team from a video made by Did you know Gaming about Hit and Run, but I didn't make an account here or started playing the mod until recently since it peaked my interest after playing the game fully for the third time and I have been watching a lot more Simpsons episodes in my spare time.